AXPERT- i-sine Active Front-end Converter (AFC) is an intelligent device, which reduces the harmonics and improves the power factor of utility side. AXPERT- i-sine is the best solution for the applications which requires dynamic braking. It helps to save energy by feeding the excess energy back to the grid. 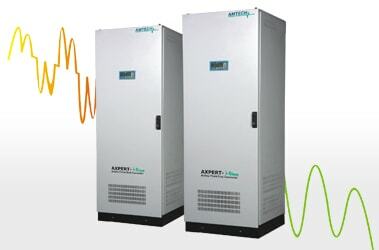 AXPERT- i-sine AFC can be used with AC drive(s) for the mitigation of harmonic. It can be used for multiple drives also. some of the unique features of AXPERT- i-sine Active Front-end Converter are as under. The control algorithm dynamically changes the switching frequency, which keep input current THD less than 5% at rated load condition. They reduce total Harmonic distortion (THD), improve the power factor and facilitates compliance to IEEE519 1992 standard. User can select the input power factor from 0.95 lead to 0.95 lag. Improves power quality by reducing harmonics and improving power factor. Reduction in heating of power cables, electronics systems due to less current harmonics at input side. Elimination of nuisance tripping in circuit breakers due to reduction in harmonics. Energy saving by feeding excessive power of DC bus to supply grid. Operational reliability and high availability. The AXPERT- i-sine Active Front-end Converter actively controls the input current THD and power factor regardless of motor speed and percentage of rated load. Even if supply voltage distortion is 5% the supply side performance is good. The performace of AXPERT- i-sine is less affected by supply voltage harmonic distortion.